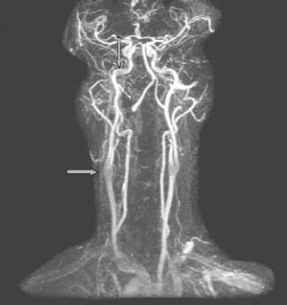 One of the main advantages of MR over other imaging modalities is the ability to evaluate flow (blood or CSF) in a noninvasive manner with or without the need for contrast agents. Moving spins exhibit two properties that are fundamental to the understanding of flow effects in MRI. 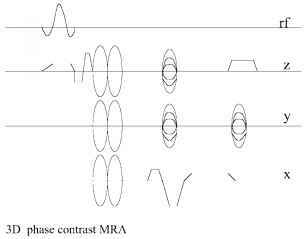 Time of flight describes the position change of spins as they move in and out of the imaging volume (slice or pixel) during the pulse sequence, i.e., the effect of time elapsed between RF labeling and sampling of moving spin magnetization (Fig. 27). Time-of-flight effects can result in either signal increase or decrease depending on the pulse sequence's repetition time, the T1 of flowing fluid and stationary tissue, the velocity of the fluid, and slice thickness. The aim is to maximize the signal of the flowing spins and minimize the stationary background tissue signal. Fig. 27. In the time-of-flight (TOF) technique, the maximum signal results from an inflowing velocity that completely replaces the imaging slice with fresh or unsaturated spins. Fig. 28. A basic gradient-echo pulse sequence design. rated spins will then ultimately determine the final average signal within the pixel volume. The relationship among the slice thickness, TR, and velocity is described by the formula ^max = slice thickness/TR where ^max represents the maximum inflowing velocity that completely replaces the slice with fresh spins at TR and therefore generates the most signal. A velocity too low or a slice too thick will result in a higher proportion of saturated spins and therefore decreased overall signal. For a velocity greater than Vmax, there will be a loss of signals, as more unsaturated spins are exiting than entering the slice between the 90° and 180° RF pulse. This is particularly important in spin-echo sequences: both 90° and 180° RF pulse are slice selective, and a 90° "pulsed" spin that exits the slice before the 180° RF pulse will therefore not give a signal. In addition, a longer TE will also favor signal loss as the spins are more likely to have left the imaging volume (27,28). Fig. 29. 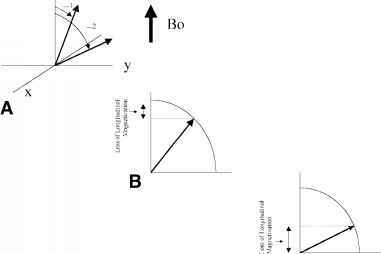 (A-C) In gradient echo, the size of the flip angle affects the degree of longitudinal magnetization, loss being greater with larger angles. The resulting partially recovered magnetization vector then becomes the "starting" vector for the next pulse. This is particularly applicable in the steady-state gradient-echo sequence. other words, gradient-echo imaging maximizes the high signal of incoming spins while minimizing the outflow signal loss. The flip angle (a) is important in gradient-echo imaging, in which a larger angle contributes to more effective saturation of stationary spins, especially those with longer T1 magnetization (Fig. 29). One should also note that when flow velocity is not constant or cyclic, there would be loss (and less often gain) in signal owing to turbulence in both CSF (Fig. 30) and vascular flow. Fig. 30. 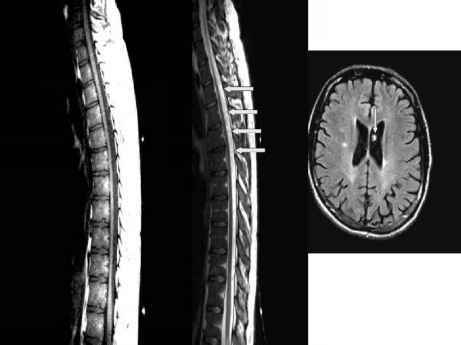 CSF flow artifact along the posterior aspect of the T-spine on T2 images manifested as multiple amorphous areas of decreased signal within the CSF that is not substantiated on T1 images (left). 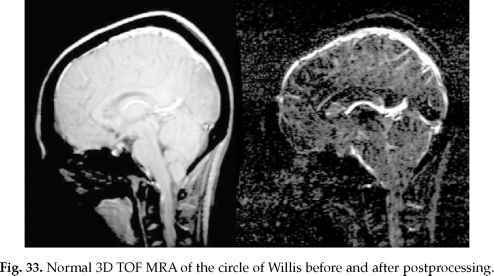 Unilateral and often bilateral increased or decreased oval area of signal abnormality within the lateral ventricles caused by flow artifact from CSF traversing the foramen of Monro (right). lack of signal from phase dispersion, often occurring at sites such as the carotid bulb, the siphon, or sites of vessel tortuosity (Fig. 31). 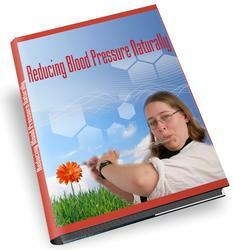 Various methods have been employed to counteract such higher order motion including gradient moment nulling, creating different gradient waveforms and timing, and employing respiratory and cardiac gating; these techniques are beyond the scope of this chapter (27,29). Fig. 31. 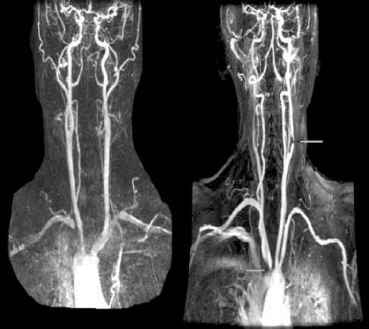 Bilateral subtle loss of flow signal at the carotid bulb and petrous carotid on TOF MRA owing to flow turbulence. Fig. 32. 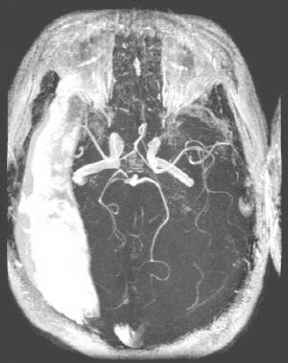 3D TOF image of the circle of Willis shows "shine-through" of subcutaneous and intraorbital fat as well as a large right subdural hematoma owing to the short T1 effects of fat and subacute blood. Fig. 34. A simplified version of a 3D phase-contrast MRA pulse sequence. rf, radiofre-quency.